Many female workers in global supply chains experience high levels of harassment and violence, both in the workplace and in their personal relationships. This violence, which can be economic, emotional, physical, or sexual, deprives women of their basic human rights and compromises their well-being. In addition, an increasing amount of evidence shows that when the well-being of workers suffers, businesses and economies are negatively impacted. Violence against women is bad for business, and there is a high cost to inaction. 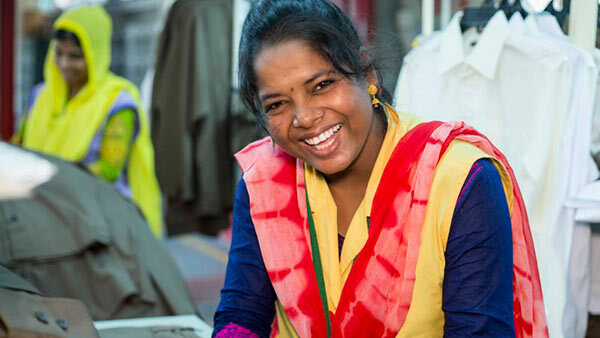 1 in 7 women garment workers has been raped or forced to commit a sexual act. 47% of Indian women feel the top issue at work is sexual harassment. I think this training is useful, and we should implement it in our daily lives. It is important for people to behave with respect towards each other. We can set the example—if people see that we behave respectfully towards them, they may behave like this with others. At work, I would say that if I see anyone behaving badly, I will talk to them about it—regardless of whether they are a supervisor, a line manager, or a co-worker. I will tell [them] to discuss their problems rather than screaming over people. This training has taught me that rather than getting aggressive or angry about the situation, it is easier to find a solution if both parties calm down and have a discussion about it. I would like to teach my daughter both Arabic and Bengali. And if I can afford it, I would like her to become a doctor. If everyone in our society starts believing that men and women are equal, we have a chance to change things.